To sign up to the Skincare By Hive Originals Newsletter, simply click the Request Newsletter button below and you will receive amazing special offers, discounts and access to secret sales. Discover the Incredible Skin Benefits of Honey Bee Ingredients! Explore the most incredible range of skincare products around. Hive Originals bring you a beautiful selection of skincare, hair care and candles made using honey and honey bee ingredients. Sign up to their newsletter today to discover all they have to offer. Explore everything from body lotions, honey night creams and sensitive scalp shampoos to rich honey hand creams, intensive hand balms and so much more. If you suffer with problematic skin, their products are the solution you've been looking for! Whether you have eczema, dry skin, acne or scarring, their skincare has properties that could soothe and treat your problematic areas. Honey retains moisture and keeps the skin hydrated with a youthful glow. It cleanses, nourishes and moisturises the skin, keeping the pores unclogged - explore their amazing range to give your skin it's glow back. If you're looking for a new face cream for yourself, looking for a beautiful handmade candle or trying to find your man a new natural moisturiser, they have what you need. Experience the amazing benefits of British bee sourced ingredients today! A natural healer to the skin, let your skin feel pampered, protected, hydrated and youthful from the natural honey and protective beeswax. 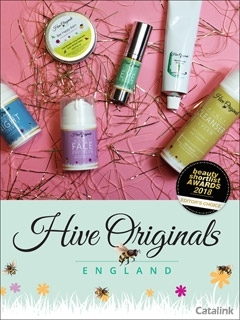 Sign up to the Hive Originals newsletter today to pamper yourself and receive member only updates and offers on beautifully natural skincare, made by British bees! By Pressing the Request Newsletter button you give Skincare By Hive Originals (and their Data Processors for the specific purpose of delivering your emails) consent to send you their newsletter via email until such time as you choose to unsubscribe.